Ordinary Difference Equations. Difference Equations of First and Second Order. Examples of Difference Schemes. Boundary-Value Problems for Equations of Second Order. Basis of the FEBS Method. Difference Schemes for Ordinary Differential Equations. 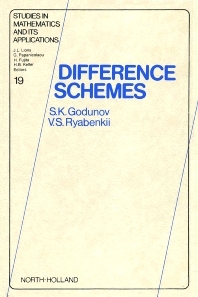 Elementary Examples of Difference Schemes. Convergence of the Solutions of Difference Equations as a Consequence of Approximation and Stability. Widely-Used Difference Schemes. Difference Schemes for Partial Differential Equations. Basic Concepts. Simplest Examples of the Construction and Study of Difference Schemes. Some Basic Methods for the Study of Stability. Difference Scheme Concepts in the Computation of Generalized Solutions. Problems with Two Space Variable. The Concept of Difference Schemes with Splitting. Elliptic Problems. Concept of Variational-Difference and Projection-Difference Schemes. Stability of Evolutional Boundary-Value Problems Viewed as the Boundedness of Norms of Powers of a Certain Operator. Construction of the Transition Operator. Spectral Criterion for the Stability of Nonselfadjoint Evolutional Boundary-Value Problems. Appendix: Method of Internal Boundary Conditions. Bibliographical Commentaries. Bibliography. Index. Much applied and theoretical research in natural sciences leads to boundary-value problems stated in terms of differential equations. When solving these problems with computers, the differential problems are replaced approximately by difference schemes. This book is an introduction to the theory of difference schemes, and was written as a textbook for university mathematics and physics departments and for technical universities. Some sections of the book will be of interest to computations specialists. While stressing a mathematically rigorous treatment of model problems, the book also demonstrates the relation between theory and computer experiments, using difference schemes created for practical computations.